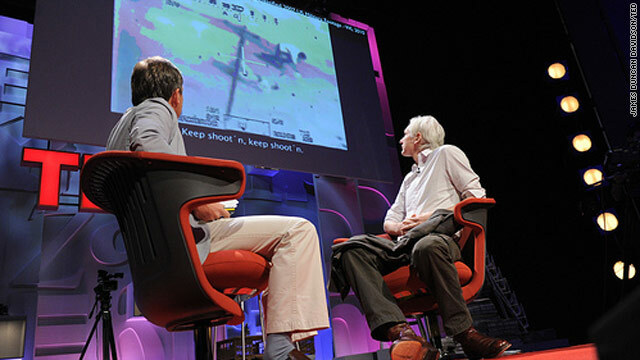 Julian Assange, right, talks about submissions to WikiLeaks.org with Chris Anderson at Friday's TED Global conference. NEW: Pentagon says Pfc. Bradley E. Manning is accused of "serious offenses"
Assange: Manning is a "political prisoner"
Oxford, England (CNN) -- WikiLeaks.org, the website that released secret video of a U.S. airstrike in Iraq that killed a dozen civilians, is "getting an enormous quantity of whistle-blower disclosures of high caliber," the site's founder, Julian Assange, said Friday in a rare public appearance here. Speaking at the TED Global conference, Assange said that "we are overwhelmed by our growth" and the site can't keep up with the volume of the new material because it doesn't have enough people to verify it. He later told reporters that "there are many things which are very explosive." Assange said the organization gets material from whistle-blowers in a variety of ways -- including via postal mail -- vets it, releases it to the public and then defends itself against "the regular political or legal attack." He said the organization rarely knows the identity of the source of the leak. "If we find out at some stage, we destroy that information as soon as possible," he said. Pfc. Bradley E. Manning, 22, of Potomac, Maryland, has been charged with eight violations of the U.S. Criminal Code for allegedly illegally transferring classified data, including the video that wound up on WikiLeaks. He has been accused of "wrongfully introducing a classified video of a military operation filmed at or near Baghdad, Iraq" around July 12, 2007, "onto his personal computer, a non-secure information system." Assange said at a news conference that Manning "is a political prisoner being held in the nation of Kuwait, effectively keeping him away from the press and effective legal representation." He said WikiLeaks is providing legal assistance to Manning without saying if he was the source of the video. "Obviously, we cannot pick and choose," said Assange, adding that the site has to defend everyone who faces serious charges as a result of material posted on WikiLeaks. The video shows aerial footage of an attack by a U.S. Apache helicopter that killed civilians, including two journalists from the Reuters news service. WikiLeaks posted it in April. The site said the video "clearly shows the unprovoked slaying of a wounded Reuters employee and his rescuers." Asked to respond to Assange's assertion that Manning is a "political prisoner," Pentagon spokesman Col. David Lapan told CNN that Manning is "accused of committing serious offenses. He has been charged under the Uniform Code of Military Justice and will be processed by normal procedures through the military justice system." U.S. military authorities have warned that the publication of classified documents on WikiLeaks could aid in the planning of terrorist attacks and harm national security. At the Oxford event, Assange said, "Remember the people in Baghdad, the people in Iraq, the people in Afghanistan, they don't need to see the video. They see it every day." He said the site's hope is that such video "will change the perception of the people who are paying" for the war. Assange denied reports that WikiLeaks had received hundreds of thousands of classified U.S. cables in addition to the Iraq video. He said the site would have released the cables if it had received them. Assange said some information, including a patient's medical records, should legitimately be kept secret. But he said WikiLeaks's practice of revealing information from whistle-blowers follows the traditions of journalism. The fact that governments and organizations spend money to keep this information secret, Assange said, is a good indication that releasing the information can achieve reform. The 39-year-old Assange, who has gray hair swept back behind his ears, noted that WikiLeaks operates in several countries, including Iceland and Sweden, where, he said, laws give protection to the disclosures made on the site. He said he had to cancel three public appearances in the United States, including one at the June conference of Investigative Reporters and Editors in Las Vegas, Nevada, because of "unreasonable" statements by U.S. officials in private that they "may not follow the rule of law" in dealing with him. "I received advice from figures like [investigative reporter] Sy Hersh to exercise caution," Assange said, adding that U.S. officials have now adopted a "reasonable" attitude in private. Assange was interviewed by Chris Anderson, curator of TED, the nonprofit that ran the conference. He asked the audience for a show of hands as to whether he was a hero or a "dangerous troublemaker." The vast majority signaled that they viewed him as a hero. CNN's Mike Mount and Alan Silverleib contributed to this report.